Dialogues from Upanishads or Knowledge of Self) by Swami Sivananda was published in 1936. 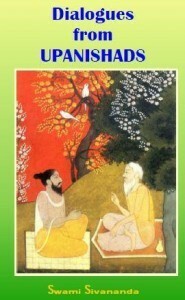 The books focuses on dialogues from the Upanishads which deals with Jnana or Knowledge of the Self. These topics are hard to decipher from the original texts but are here presented in a more lucid manner. Especially the dialogues between Uddalaka and Svetaketu in Chandogya Upanishad and the ones between Yajnavalkya and Raja Janaka in Brihadaranyaka Upanishad are highly instructive and contains advanced lessons on subjects such as non-duality. Dialogues from the Upanishads deals with Jnana or Knowledge of the Self.